Democratic presidential candidate Hillary Clinton has now collected more than $5 million in bundled lobbyist contributions, many of which come from lobbyists who represents industries that she opposes on the campaign trail, recent campaign finance filings show. Clinton added another $1.5 million in special interest cash from a handful of bundlers during the first quarter of 2016, which spans the period Jan. 1 to March 31, 2016. Lobbyists had already raised $4.1 million for Hillary for America before these bundled donations were reported. The Clinton campaign received $73,100 in bundled donations during the first quarter from Ankit Desai, a lobbyist for the Houston-based company Cheniere Energy, which operates natural gas terminals and pipelines. Cheniere has given between $1 and $5 million to the Clinton Foundation, with contributions coming as recently as 2015. A number of Cheniere’s executives and directors have contributed to Clinton campaigns as well. Neal Shear, a former employee of Morgan Stanley who now works as Cheniere’s interim chief executive officer, gave $2,300 to Clinton during her presidential run in 2007. Heather Zichal, a Washington, D.C.-based energy consultant who acts as the company’s director, gave the maximum $2,700 to Hillary for America shortly after the campaign launched in April 2015. Anatol Feygin, the company’s senior vice president of strategy, gave $2,700 in August 2015. Katie Pipkin, the company’s senior vice president of business development and communications, gave $2,700 in May 2015. Clinton has come under fire from environmental activists for taking money from the oil and gas industry while demonizing the sector on the campaign trail. Greenpeace recently hit Clinton for the millions her campaign has taken from oil and gas interests. Greenpeace has kept a running tally of her contributions and connections to the industry, and has discovered 65 oil, gas, and coal lobbyists who have donated to her campaign or have given to super PACs supporting her candidacy. The group wrote that Clinton has received nearly $7 million in total from people connected to the industry. Mary Landrieu, the former Democratic senator from Louisiana, bundled $39,800 for Clinton between January and April. After Landrieu was defeated in 2014 by Republican Sen. Bill Cassidy, she joined Van Ness Feldman, a Washington, D.C.–based firm that has lobbied on behalf of TransCanada Corporation. TransCanada paid the firm hundreds of thousands of dollars to push for the construction of the Keystone XL pipeline, which Clinton opposes. Despite her opposition to the pipeline, Clinton accepted $1.6 million from two Canadian banks closely connected to the promotion of Keystone XL. 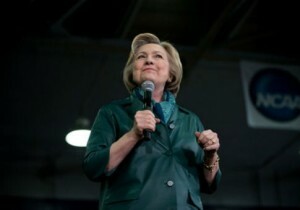 Clinton received the sum as compensation for eight speeches she gave before entering the Democratic primary. During the first Democratic debate in October 2015, Clinton was asked to list the enemies that she was most proud of making during her career in politics. She listed health insurance and drug companies along with the National Rifle Association, Iran, and Republicans. "Well, Anderson, there are plenty of folks who might think of me as their enemy: the NRA, the health insurance and drug companies, Iran, and probably the Republicans," Clinton said. Despite this remark, Clinton has benefited from campaign contributions from lobbyists who represent health insurance and pharmaceutical companies. David Jones and Richard Sullivan, both partners at the Washington, D.C.-based Capitol Counsel, are top bundlers for Clinton’s campaign. Jones gathered $386,961 for Clinton’s campaign while Sullivan pulled together $319,750 through late December. Capitol Counsel pulled in $2.6 million for representing 11 pharmaceutical companies in 2015. The group also received hundreds of thousands from the health insurance industry, including a $360,000 payment from Blue Cross Blue Shield. Jones bundled an additional $276,680 for Hillary for America during the first quarter, while Sullivan bundled an additional $103,748. Tony Podesta, owner of the Podesta Group, added another $35,560 in bundled contributions for Clinton this year. Podesta has now bundled more than $415,000 for Clinton. Tony is the brother of John Podesta, the chairman of Hillary Clinton’s campaign. The Podesta Group made $1.5 million lobbying for seven pharmaceutical companies last year. The group also made $400,000 from the health insurance industry. Podesta refused to comment on the bundled donations. Neither Clinton’s campaign nor any of the other lobbyists returned requests for comment. A number of press accounts have stated, incorrectly, that Van Ness Feldman represented TransCanada on the Keystone Pipeline matter. The law firm has been honored to represent TransCanada on a number of issues, most particularly the proposed Alaska Natural Gas Pipeline project, which is now defunct, but did not represent TransCanada on the Keystone Pipeline project. More specifically, we did not lobby Senator Landrieu on that project when she was in the Senate.